Protesting has a long history in the United States. Sporting events have been used by a variety of athletes to protest inequality and social injustice. Learn more about the most recent athletic protests in this week’s CLP Current Event. How important is this right? How do we encourage people to speak out for their most basic beliefs? Are we responsible for helping others to speak even if we disagree with what they say? CLP: This site requires a login for to read the entire article. Do employers have the right to demand certain behaviors from their employees? What influence does Nike have on sports? What does Nike say in the 30th anniversary advertisement? Do athletes have the right to protest during a game? Do athletes have an obligation to protest? Do athletes have special status in our society? 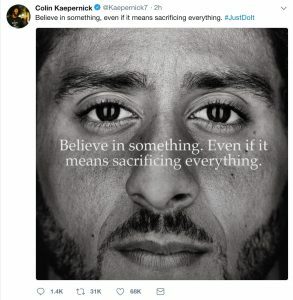 What does, “Believe in something, even if it means sacrificing everything”, mean? What is the “something” that is worth “sacrificing everything”? What is racial injustice? What is police brutality? Why are athletes protesting during the National Anthem? What are the athletes protesting? What is collusion? How has the NFL dealt with Colin Kaepernick? 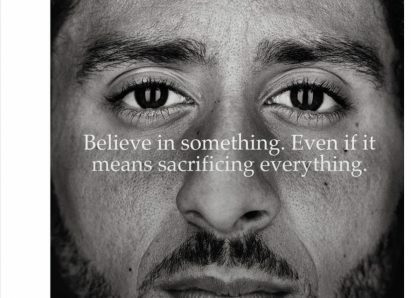 What do supporters of the Kaepernick ad say? What do opponents of the Kaepernick ad say? Why might an athlete choose to participate in this form of protest? Why might an athlete choose not to participate? Is there a “proper” time or place for engaging in collective action? What’s the significance of this action taking place at sporting events? The concerns raised by Colin Kaepernick aren’t new, so why are these protests sparking such attention now? How does this form of collective action connect to past movements? What role might empathy play in helping people to understand the oppression at the center of these protests? What could people do beyond taking a knee to help address the concerns behind that action? Also see CLP Current Event on Colin Kaepernick from September 26, 2017. CLP: Resources showing multiple perspectives on protest from a variety of sports legends. Unit 5, Lesson 23: How does the Constitution protect freedom of expression? Unit 5, Lesson 29: How does the First Amendment protect free expression?